The new version (5.4) of OpenSSH has been released early this morning. 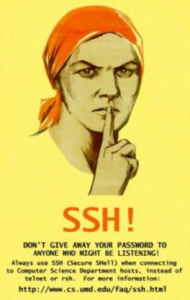 OpenSSH is THE free implementation of the SSH protocol available on common devices and operating systems. Multiple authentication methods and single sign-on (via the agent-forwarding). Netcat can also be compared to a Swiss-army knife at TCP/IP level. It is a multi-purpose tool which allows to read and write data across network connections. Originally, it was a tool available on UNIX flavors but Netcat (or “nc”) is also available for Windows [Note: the Windows version is often detected as suspicious by common anti-virus softwares]. Netcat lacks of … encryption (if your original data are in clear text) but now, with the brand new OpenSSH, we can pipe data safely! Once the SSH session has been opened and the port successfully binded, you need to use a native client to connect on this port. And such command can be disabled by a local security policy or not installed at all! A common usage is to create a tunnel for POP3 traffic (TCP/110) but a POP3 client will be required and reconfigured to use the localhost/port defined at the command line level. SSH must bind a port to the localhost. To bind a port below 1024, you must have root privileges! This can be a problem if the client cannot change the default port. And even if the chosen port is above 1024, traffic can be blocked by local firewall rules. As OpenSSH connects STDIO to the remote host/port, you are free to type your commands or data, copy/paste them or pipe them to the SSH process. SSH Version 1 support is now disabled by default! After 10-years! A ‘read-only’ mode is available to sftp-server. For a complete review of changes and bug fixes, have a look at the official announce. Pingback: Back to Basics : Le Bastion SSH | OCTO Talks ! how do you do SSO with agent-forwarding?